Reader Question: My fiance and I went through so many phases in our planning- anger, frustration, happiness, sadness, etc. but now we're finally in a good place. Now that we feel good about our decisions, I've been able to focus more on the "details". I really liked your recent post about clapping during the ceremony and recruiting the help of guests in making that happen. Then I was thinking, how can I take our ceremony to the next level and I thought- Confetti Poppers! Of course, dispensing tons of teeny pieces of paper around a local park is not going to fly with me or anyone, so I was wondering if you had suggestions on eco-friendly confetti or something that is more natural that our guests can throw? Hmm...the only thing that comes to mind is bird seed (and the packaging above is utterly adorable).Or maybe something from the bulk aisle at Whole Foods? Like millet or barley or something? Also I have *heard* that you can get eco-confetti paper that dissolves instantly when wet. Unfortunately the only place I have seen it is in Australia and it is fricken expensive. I second the lavender suggestion, though you will probably want to check with the park about any regulations they may have - you wouldn't want to get fined on your wedding day. Thanks, everyone for the suggestions! I definitely like the lavender idea. And I love that little bird seed packet in the picture. I'll have to hit up Whole Foods and do some exploring! I own a wedding reception hall with an outdoor ceremony site. I would LOVE it if brides threw seeds (particularly grass seed) it is light weight and would help beautify the park for the next bride. I have always heard that rice is not a good option because it is harmful to birds. Not sure how true it is, but it is worth checking into before going that route. Also, the lavendar and grass seed ideas are really cool but are they too light for distance throwing? I like the bubble idea. How pretty would it be to see lots and lots of floating bubbles? 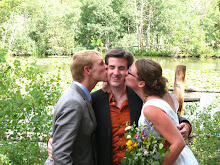 We threw whirly birds (helicopters) at our wedding. They are my favorite, ever since I was a kid. I love the way they spin and flutter to the ground- nature's perfect design! I collected them from maple trees in April, but I believe you can also order them online. I have that fear of bird seed getting in my ears and then I go deaf. No throwing of small seed for me. Flowers petals ! Can't you buy that somewhere ? (in France it's possible and i see that a lot at weddings). I wonder if you could make confetti out of edible rice paper like the kind they wrap around some Japanese candy. 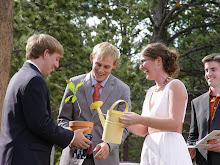 It depends on where you are having your wedding, what works out to be eco-friendly. Rice is indeed bad for birds, because it expands when it comes in contact with the water in their stomachs (much as it does in our pots) - so that's a big no-no. Birdseed can also be bad, depending on where you are. If you are in a forest with lots of native plants around, and you scatter birdseed, this can actually introduce non-native plants into the area that have the capacity to spread fairly quickly (the plant that grows birdseed is actually considered a weed). So if this is the case, check with the local park officials or ecologiists before doing anything like that. However, birdseed is obviously not going to have a very easy time planting itself on a beach. It's all a matter of your situation, but I would definitely recommend doing some research into the options first. Thanks for being concerned about this! Our wedding was in December, so we chose the white, and it looked just like snow. Beautiful! This confetti goes away with a little water- very easy cleanup! And it comes in lots of colors! We're getting married outside an aquarium so I wanted something ecofriendly tossing stuff. I found and am in love with eco-fetti I found it here http://www.ecoparti.com/toec.html I'm going to be ordering blue and green as they are our wedding colors. What about cutting up seeded paper? http://www.flowerseedpaper.com/ You still get the confetti look, and it's biodegradable. I know it's been done a million times, but rose petals? The venue we're getting married at is home to a bunch of the cutest bunnies that just run around the place when the sun goes down....I am not super keen on the rose petal lined aisle but after the coordinator at our venue told us that the bunnies love to eat the rose petals that are left at the ceremony site I said "we need petals down the aisle!" because I want to see dozens of bunnies out there after we get married! I know that didn't really help, but I couldn't resist sharing! what about having them all wave little flags?! 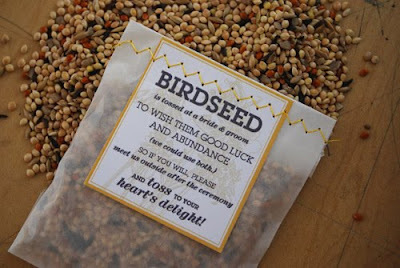 We mixed birdseed with lavender for an amazing scented "confetti" that was friendly to birds. The lavender flowers are also a little bit more lightweight than birdseed, so I didn't worry about getting pelted quite as much. Our guests are not throwing anything at us. Instead they are waving YAY flags as we exit. Ribbon Wands are also cute. I'm not a fan of these, per se, but the idea is good. I think confetti made from seeded paper would be great since it gives the same effect as regular confetti but leaves behind flowers everywhere it lands! I, too, would warn against birdseed. 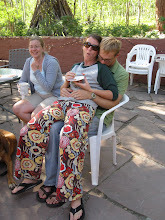 A friend chose that after her wedding to be more eco-friendly but was less thrilled with the idea after getting pelted with birdseed and spending the rest of the night with birdseed in her hairdoo and down her dress. We did the bubble thing - pretty to see, but well a little soapy when you are bombarded by them. 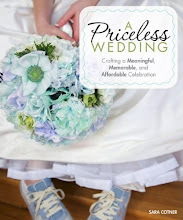 BTW when I saw the title "wedding confetti" on this post I thought maybe you had been talking to my husband - he called all of those awful catalogs that kept coming and coming once I was on a wedding list just that.